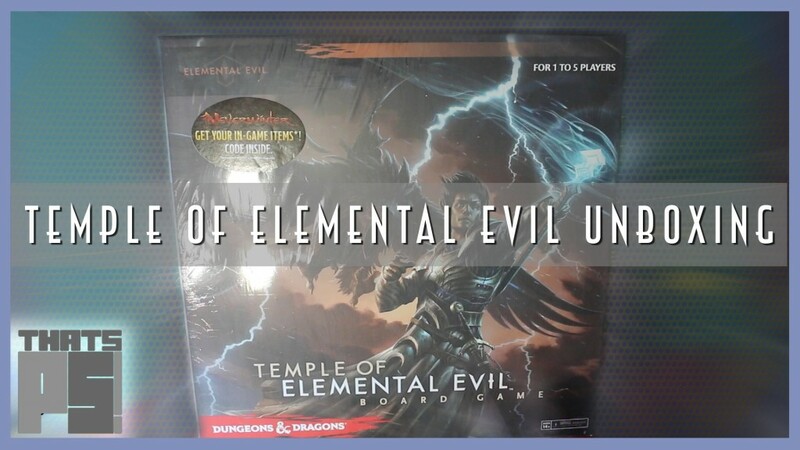 Temple of Elemental Evil Unboxing - [Dungeons & Dragons] - That's PS! Last last year I purchased myself a copy of Wizards of the Coast’s latest entry into their Dungeon & Dragons adventure system board games; Temple of Elemental Evil. It’s the 4th game in a series of games that are very simplified versions of the D&D table top games. I enjoy them because they don’t take a great deal of prep, and can be played by pretty much any body regardless of their knowledge of the Dungeons & Dragons system. Since these games are usually jam packed with lots of cool pieces, I figured I’d record myself opening up the box, and showing you all what’s on the inside. I was not disappointed. There are LOTS of miniatures, a bunch of tiles, and a crazy amount of little cardboard pieces that while not used every time you play the game, are all part of the overall gameplay as you return again and again to battle the forces of elemental evil. One of the things that really stood out as different than the previous versions, is the fact that the core gameplay is based on 5th edition, instead of 4th edition. I found that this really simplified a bunch of the game mechanics, in turn making the whole game play just a bit smoother. The other major change is the fact that this game also has a campaign mode, so as you progress through the game, you retain some items, and the deck has different components added depending on the outcome of your previous play throughs. I hope you enjoy as much as I’ve enjoyed playing this game since I opened it. Which is a lot!